When I was a kid, I wanted to be a scientist. Whether I was collecting water samples from the stream down the hill, looking through the optical telescope with my dad, or reading books about volcanoes, it was clear that I was curious about the world around me. Throughout primary school, my interests changed almost daily—ecology, astronomy, paleontology, .... In third grade, I made a list of my dream professions, 50 science disciplines long. By the time I reached high school, I had settled on a single discipline: archeology. After a decade of marathoning the Indiana Jones movies (and the original Star Wars... I had a bit of a crush on Harrison Ford) and making holes in the backyard, digging into the past seemed like the adventure of a lifetime. After I took my first chemistry course (which I fell in love with because it seemed to be glorified algebra), I figured I'd study chemistry in college. While a key tool in archaeology, carbon dating had the word "carbon" in it after al thus must be chemistry; why not go the chemistry route and apply it to any other discipline—archaeology or otherwise—that piqued my interest? A lifelong subconscious fascination with radio telescopes blossomed into a love for radio astronomy during college, and I was turned to astrochemistry. Turns out, astrochemistry isn’t completely different from archaeology. Instead of traveling the world to visit dig sites, I travel the world to visit radio telescopes. Instead of looking at artifacts from hundreds of years ago, I look at chemical signatures from parts of space hundreds of lightyears away. Instead of studying human history, I study the universe’s chemical history. I’m pretty much a space archaeologist, right? Astrochemistry is the study of the abundance and reactions of chemical elements and molecules in the universe, and their interaction with radiation. The discipline is an overlap of astronomy and chemistry. True, but not exactly glamourous-sounding and definitely not the whole picture. Astrochemistry is much bigger than cataloguing chemical abundances and reactions. It’s the study of chemistry at its most basic, stripped down level. It’s chemical evolution, looking back to before life, before a planet, before a star. It’s trying to trace our chemical origins back to comets, or even further to protoplanetary disks—the dust and gas circling a newly-formed star that will eventually snowball into planets and other bodies that will orbit the star. It’s understanding how planets form by using chemistry as a marker for where a planet formed and mapping how it moved closer or further from a star throughout a system’s history. 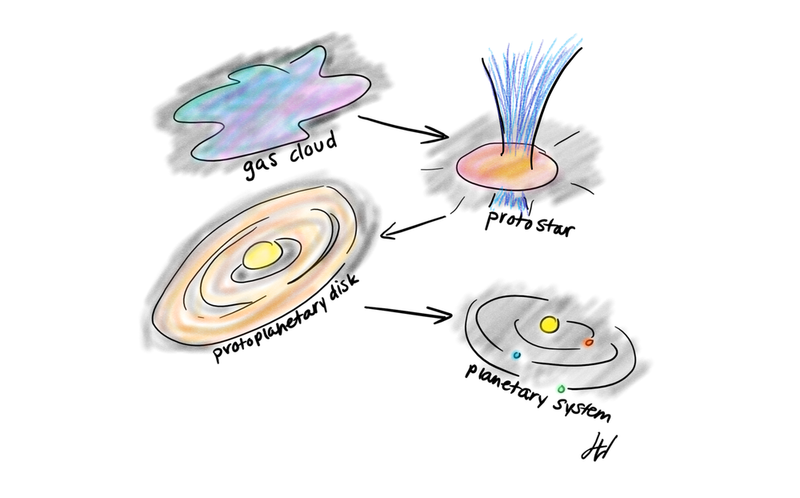 It’s a cycle of formation and destruction through stellar evolution, from the collapse of dense clouds into protostars to the formation of protoplanetary disks and ultimately planetary systems. It's extrapolating what an atmosphere of a planet looked like millions of years ago based on the chemistry we see in that atmosphere today. It's studying the weather on other planets. It's computer modeling to test reactions we can't otherwise study on Earth. It's laboratory astrophysics at extremely low pressures and temperatures. It's thinking about what life might look like elsewhere in the universe. It's tuning into the universe's radio waves and collecting them with a radio telescope. It's also using telescopes to have infrared, optical, ultraviolet, and X-ray vision of the chemical universe. It's watching the physical dynamics of interstellar clouds like the Orion Nebula, a diffuse collection of molecules, dust, and ionized gas thought to be 24 lightyears (about 140 trillion miles) across, situated over 1300 lightyears (7.6 quadrillion miles) away in the sword of the constellation Orion. It's understanding how environment influences chemical formation. It's building family trees of different interstellar species, from hydrocarbons like ethylene glycol (C2H2, a common ingredient in antifreeze) and saturated oxygen-bearing species like dimethy ether (CH3OCH3, a refrigerant and laboratory solvent) to long unsaturated cyano-carbon chains like cyanotriacetylene (HC7N, a long molecule not found on Earth). ... but it is also planetary science, map-making, computer science, mathematics, biology, physics, engineering, and art. It is understanding our chemical past, explaining our chemical present, and making hypotheses about our chemical future. Astrochemistry is chemical archaeology in space. Image showing the stages of star formation was updated on December 12, 2018, to show jets associated with the protostellar stage of star formation.